in the world you can get it . . .
You may travel to Vienna, Austria to the Imperial Cafe or . 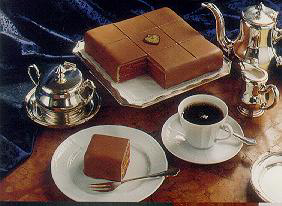 . .
You can get the Imperialcake right here in our Online Shop. The world's richest, most famous, darkest, chocolatiest, award-winning Torte! A great gift for a birthday! The Imperial Cake is an irresistible heavenly temptation even to the most sophisticated connoisseurs of good taste. The Imperial Cake is available for you and your friends in 3 different sizes for worldwide shipping. The Imperial Torte is hand made from natural ingredients only! The shelf life is guaranteed for 4 weeks. For mail order, the Imperialcake is packed in a carton box and a wooden gift box, plus a shipping carton to send to you by courier service - directly from the Hotel Imperial, Vienna, Austria, Europe. Copyright © 1997-2016 - All rights reserved.